In today’s job market, the use of technology is increasingly taking over. Positions that were traditionally held by human beings are being replaced by computers and other forms of technology in the name of efficiency. But this is not true of every position. In fact, the advancement of technology has strengthened some job titles. One of those positions is that of the Legal Secretary. When we think of what the role of a Legal Secretary entails, we tend to think of a female in front of a typewriter, transcribing in shorthand. 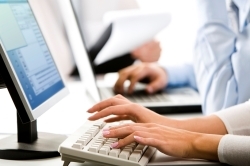 We think about typical secretarial tasks – many of which could easily be replaced with various forms of technology. Interestingly, the ever-advancing technology has made the Legal Secretary a more desirable and in-demand position. While the use of the typewriter has certainly become a thing of the past, recent technologies have made these traditional tasks far more efficient, while opening room for position holders to expand their knowledge, experience and overall value to a law firm. Software such as those that not only do voice recordings but that also transcribe and can ultimately be printed into a professional document are all adding to the value of this position. This is because instead of having to write out a session or meeting in shorthand and converting it into an easily readable document using a typewriter, the software does it all for them. The only thing that is required in this instance is basic copyediting, which is a practice used to ensure any inaccuracies are detected and corrected before final print. The thing to remember is that this transition is happening mostly in larger law firms (although it has begun to catch on in midsized firms as well). These same firms include numerous departments or services within their own premises as a means of becoming more efficient, while saving time and money. A few examples of these in-house services include print/copy centres, postal services and technology support. And just like these in-house services, the role of the Legal Secretary is becoming more and more streamlined as a means of improving efficiency in the workplace. This newly defined role of the Legal Secretary has expanded in less than a decade. The role still may take on some of the more traditional tasks, but that is mainly the case for smaller firms. More often than not, however, this role is taking on other duties such as billing, calendar input and docketing, document management and imaging, litigation presentation and support, and even research. It is taking on more of an administrative role, one that helps in a variety of capacities rather than just settling on one specific function. The reality is, the more one is flexible in their willingness to adapt or learn new and continuously advancing technologies the more in demand their skill set will be. There are already global trends that show increasing salaries for Legal Secretaries who can handle using numerous technologies. In other words, the more an individual has to offer, matched with a strong and committed work ethic, the more sought out they will become. Firms such as those that handle corporate or property law (that make use of these streamlined secretaries) are some of the top recruiters for these types of positions. To summarise, the role of the Legal Secretary is becoming increasingly more of an integral part of the legal world, rather than a solitary, dime-a-dozen position. They tend to work with multiple lawyers rather than for one individual. Their ability to operate in several capacities places them in a position of higher value, leading to a more efficient team player within the workplace. So, while many are uncertain of their job security in the era of technological advancement, one thing’s for sure, the Legal Secretary is still an important and needed member of a legal team.